Barbara Thorson, a bunny-ear-wearing and D&D obsessed fifth-grader, is, according to her teachers and classmates, pretty weird. She’s fiercely independent and sarcastic, has occasional violent bursts of anger, and proudly declares to a career counsellor who’s talking to her class that she already has a career, thank you very much—she’s a giant-killer. As the story progresses, readers begin to see the loneliness that hides behind Barbara’s independence, to glimpse the fear behind her sarcasm, and to understand that there are very good reasons for her anger. Barbara is trying to kill the biggest giant of them all. 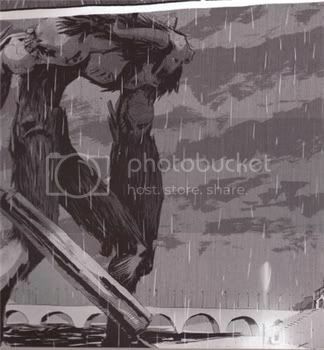 But some giants, alas, cannot be killed. 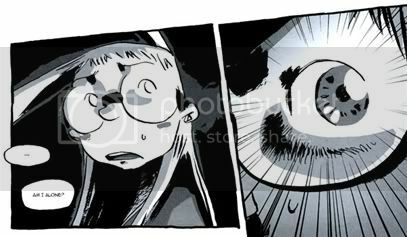 And that, I’m afraid, is all I can tell you about the story, because I Kill Giants is highly spoilable. The revelation it builds up to is a gradual rather than a sudden one, but there was still a panel that caused me to completely break down in tears. (I was reading this book at work during my lunch break—it’s times like these that make me glad I’m alone in my office all day). This panel - the whole story, really - was so very moving, so painful, and so very real. Barbara’s giant has a name, but even before we learn it, the glimpses the book gives us of Barbara's world and its mix of fantasy and reality hint at the serious things that remain unsaid. 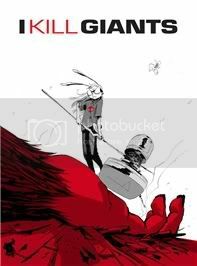 My favourite thing about I Kill Giants was probably how well it captured the psychological processes of a child facing something so horrifying she can’t quite grasp it; how well it portrays her sense of helplessness and her attempts not to be helpless. But as Barbara learns, sometimes being brave means realising that there are things you cannot fight. There is no way around how sad this story is, but there’s a sense of acceptance mixed with the sadness, a determination to make the most of her circumstances on Barbara’s part, that turns what could have been a devastating ending into a bittersweet one. There’s no denying the pain, but as Barbara tells herself in the final panel, we are stronger than we think. 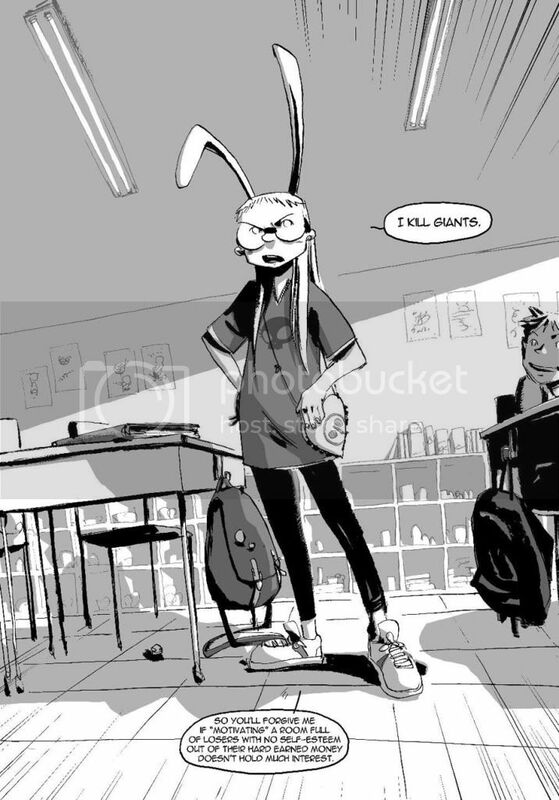 I honestly don't have enough superlatives to describe I Kill Giants. The story's sheer power, the expressive artwork, the excellent characterization, and the sensitive way in which the characters' emotions are handled made it an instant addition to my list of favourite graphic novels. You know you want to read it too. The artwork is stunning, I must say. You have been on a real roll here lately...not too many duds! I'm intrigued by this book. I might try to find it for the GN Challenge. The character REALLY reminds me of a girl in my daughter's class. She is basically in her own little world, highly brilliant, and ostracized by her peers. I have a soft spot for her. Your description, a bunny-ear-wearing fifth-grader, is enough to make me want to read this! I was sort of like that myself (although my bunny ears were not actually visible). Thanks (or no thanks! :--) )for bringing this book that now I want to read to my attention! Oh Ana this sounds AMAZING. So amazing, in fact, that I said nevermind to my January plans and went to my library's website to request it. Unfortunately, they don't own it (Arg! Horrible GN selection! ), and no stores anywhere near me carry it either. :( So I'm on the waiting list at bookmooch. Wow...how come I've never heard of this book before?!! (Oh yeah, probably that living in a cave thing, huh?) It sounds like such an incredible book, Ana. I still have gift card...this will be mine soon. Thanks, Ana. You know, I'm tempted to scold you for the amount of damage you've done to my wish list already this year, but how can I scold you when you introduce me to a book as wonderful as this, huh? Without knowing what Barbara's giant is, I love her character and feel for her. Your review is fantastic! You have convinced me! I'm going to see if my library has this one. I love the bunny ears and think that Barbara sounds so special although I'm afraid of it too because it sounds like it will make me cry! Wow! This sounds like a very powerful read and you have totally sold me on reading this graphic novel. I don't read many of them, but I have a feeling that this will be one that moves me very much. I like the artwork too. Very solid and clean looking. Great review, Nymeth. Once again, you recommend a book that I can't deny wanting to get my hands on!! I like the artwork! I would like to pay more attention to graphic novels one day. They're quite costly over here, though. Thanks for the review, Ana! I've seen my future. I will add this book to the list and covet it mightily. Neither my bookshop nor my library will have it, and I am on a book-buying ban anyway. Many months will go by, and I will forget all about it, and then around October, it will appear at my library. Without having read the book, and with your practical vagueness in the review, this reminds me of what you were saying about Mary Poppins the other day - only older, and more serious. You're so evil (and I mean that in a good, Bad Blogger way of course). I.Want.This.Book.Now! Ok, so I'm still really happy that I got Blankets the other night when I went graphic novel shopping, but now I REALLY wish that I would've splurged and just got this too :p I just wish graphic novels weren't so expensive!! I would've ended up spending like $50 if I would've gotten both :( But damn this sounds so good. Like I said, I flipped through it and I can see everything you said. It does look like a very emotionally packed book and the art really is so beautiful! This is an incredible book, I loved it and I cried. My library just bought this, so I am looking forward to reading it when it comes in! OK this sounds like a must have for me. Will try and convince my hubby to guy it for me, I will play up the D&D angle! Thanks for the review, I hadn't heard of it before. Sandy: It's mostly that I wanted to tell you about the books I really loved first :P I have a few meh reads saved for next week. And awww, I have a soft spot for that girl too just from hearing you talk about her! Rebecca: I hope you enjoy it if you do, though enjoy might not be the best word. The perspective worked really really well. Jill: They explain in the afterword how the ears were not in the script, but the artist wanted something that would make her visibly different, and took the idea from Japanese fashion trends. I think it was a great idea! Amanda: I'm so sorry they don't have it :( Hopefully a copy will appear on BookMooch before too long. Kathy, your heart will break when you do find out :( It's such a sad book, but SO worth it. Belle: Who's the short story by? I want to read it! Zibilee: I think this would be a great intro to the GN medium, so absolutely go for it! Alice: Yeah, same here :( And to make matters worse libraries don't carry them at all. 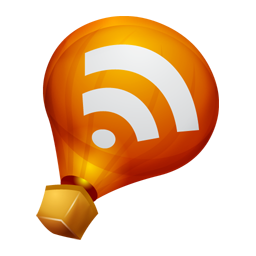 Lightheaded: lol! Evil in a good way, eh? :P Well, so are you! Hagelrat: It absolutely is. Thank you for your comment urging me to read it asap the other day! Kailana: yay! Can't wait to hear what you think. I was so impressed with the artwork that I picked this up as it came out in individual issues. You are right, it is powerful and very well done. An excellent review, Nymeth. You didn't give anything away as a spoiler and yet able to convey what the story is about. No one picking this up should be surprised by the subject matter nor, I hope, will they disagree that this is well worth the read. Awesome review. Another one to be read! I'm sure this is one I will love. I don't know if you've already read it, but I think The Complete Persepolis by Marjane Satrapi would by worth checking out for your graphic novel challenge, or just to read. It's a coming of age memoir set in Tehran during the Islamic Revolution in comic form. So I finally got around to reading this. It went out of stock in Amazon when The Boyfriend tried to get it for me earlier this year, but he found it again last week, and can I just say Thank You for your review, because I loved this. And I never would have picked it up without your review. Such a great blend of words & art. Really great. I just found out about this book yesterday, and I couldn't be happier. This is one of the best stand-alone graphic novels I've read recently; a pristine example of visual sequential storytelling, that everyone should read.